Sen. Lindsey Graham (R-S.C.), a Trump ally, blocked the resolution in the Senate later Thursday, after it passed the House. Graham, who chairs the Senate Judiciary Committee, objected to the resolution after Senate Minority Leader Charles Schumer (D-N.Y.) refused to add a provision to the measure asking the Department of Justice to appoint a special counsel to investigate DOJ misconduct in the probe of 2016 Democratic presidential nominee Hillary Clinton's email use and the Carter Page Foreign Intelligence Surveillance Act applications. 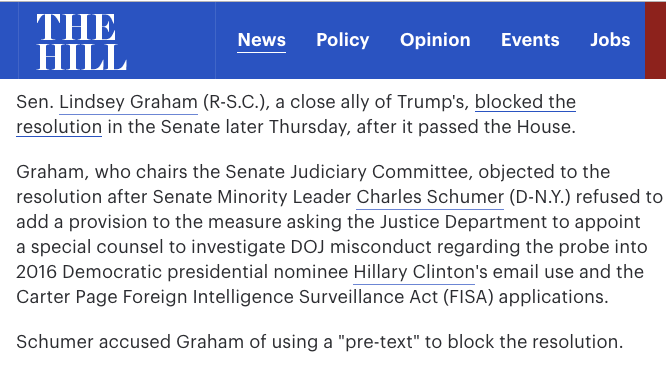 Schumer accused Graham of using a "pre-text" to block the resolution. … from Medieval Latin textus "the Scriptures, text, treatise," in Late Latin "written account, content, characters used in a document," from Latin textus "style or texture of a work," literally "thing woven," from past participle stem of texere "to weave, to join, fit together, braid, interweave, construct, fabricate, build," from PIE root *teks- "to weave, to fabricate, to make; make wicker or wattle framework." … from French prétexte, from Latin praetextum "a pretext, outward display," noun use of neuter past participle of praetexere "to disguise, cover," literally "weave in front" (for sense, compare pull the wool over (someone's) eyes); from prae- "in front" (see pre-) + texere "to weave," from PIE root *teks- "to weave," also "to fabricate." In the case of pretext, I just never thought about its history, which is pretty clear once the issue comes to mind. But I wouldn't have guessed subtle and dachshund — another piece of evidence that etymology is not always destiny. Nobody pulls the wool over Mark Liberman's eyes! The style of monastic lettering, prevalent in Germany in the late Medieval period, that Gutenberg adopted for his original metal types is called textura, purportedly because the appearance on the page is that of woven cloth. Earlier script styles likely would not have produced that metaphorical sense. What I find weird is that the original writer of the article at The Hill didn't know the word pretext. Also, shouldn't that be "used [something] as [a?] pretext", maybe "used X as [a?] pretext to X"? Just "used a pretext" does not seem grammatical to me. But I'm not a native speaker and my Bulgarian usage of "pretext" might be interfering. Sorry, that should be "pretext _for_", maybe? Sorry for posting multiple times. V, it seems to me quite possible that the article was composed off-line using (e.g.) Microsoft Word, that "pretext" ended up at the end of a line, was hyphenated, and when the Word document was copied as source for the final version, the spurious hyphen was inadvertently copied at the same time. This is a question about my English usage. My instinct when using the word "pretext" is the following: "[referent] used [NP] as pretext for [VP]/[NP]". Is that roughly correct? I wonder if the toga praetexta in its function as formal attire is a link in the etymological chain. I always wondered what that dachshund was doing on the roof. Paul and Sen. Ron Wyden (D-Ore.) have introduced a bill titled the “USA RIGHTS Act” imposing reforms on the 702 program. The legislation would impose common sense reforms to the program and end so-called “Backdoor Searches” that allows warrantless searching of databases containing the communication of Americans and stops the practice of reverse targeting where an intelligence authority can use communication with a foreign national as a pre-text to target an American citizen. This bill strikes the proper balance between security and the Bill of Rights. The only leverage that Wyden and Paul have to get a debate and vote is the filibuster. I had always pronounced and heard 'dachshund' as 'dash-hound' (and probably would have spelled it 'daschund', it makes sense – it 'dashes' everywhere), until an owner pronounced it 'dacks-h-nd' (with a schwa). Dictionary.com gives 'dacks' first (with various hund/hound for the second syllable) before giving 'dash' last. Wikipedia only gives 'dacks' pronunciations. Google has 4 million results for 'daschund', but asks 'did you mean dachshund?' which has 63 million. @ david …. sorry to be the bearer of bad news, but… i really doubt anyone aside from you says "dash-hound"
"Dash-hound" was not an uncommon pronunciation when I was young (it may still be, but I hhaven't paid attention). At any rate, I doubt David is quite as much of an outlier as AG suggests. See for example https://www.pinterest.com/helenwheeler716/dash-hound/?lp=true . @AG If 4 million people write 'daschund' where Google can find it, I can't be be the only person to say 'dash-hound'. Funnily enough, nobody has said Dachshund in German in living memory. It was shortened to Dackel long ago. AG, "dash-hound" is prevalent (or maybe used to be) in many places. realize that it refers to the same breed. American dachshund/Dackel fanciers call them "doxies." Eurobubba, according to AHD, dachshund is not from modern German dach = roof, but Old High German dahs = badger. But they also say it’s probably not from the IE root teks-. Yes, AFAIK, doxies were bred to flush out badgers. Plus, the fact that it's in scare quotes really makes it seem like the article author didn't know the word. | … according to AHD, dachshund is not from modern German dach = roof, but Old High German dahs = badger. Er, isn't it from modern(-ish) German "Dachs" (=badger)?